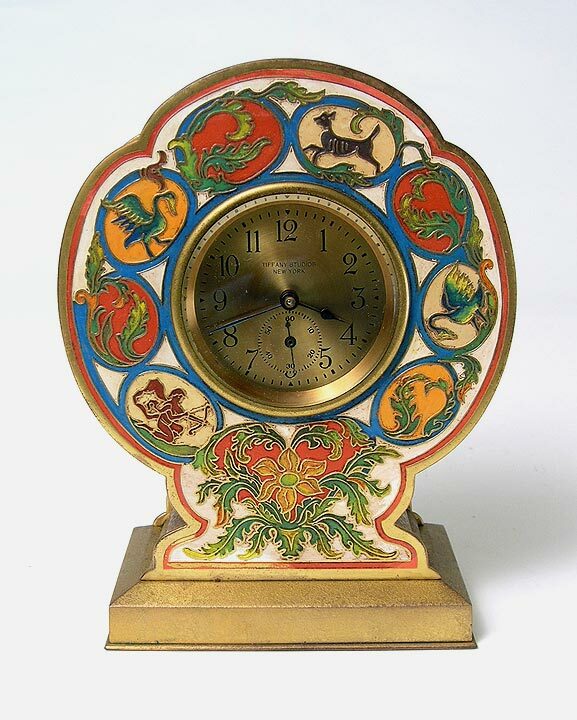 When Tiffany Studios reorganized into Tiffany Furnaces, they added enameling to their repetoire, which is the highlight of this wonderful, totally original clock. It's actually in good working order, having been to a clockmaker recently. Usually I sell clocks as decorative items and don't guarantee the mechanism, but not in this case. Sold originally by Tiffany & Co. 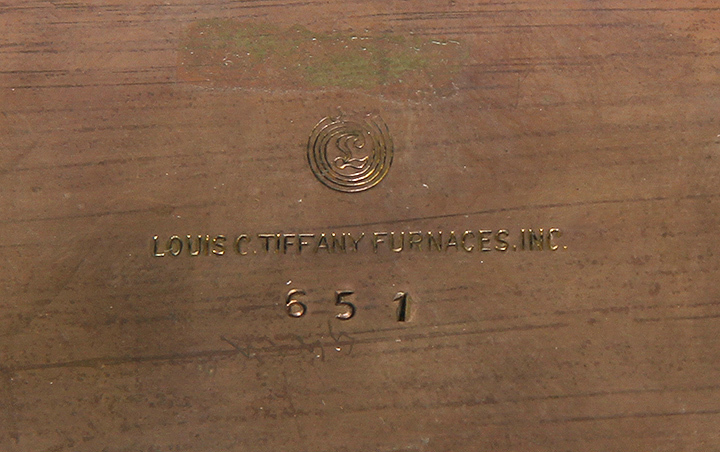 It's signed Tiffany & Co. on the face and Louis C. Tiffany Furnaces, Inc. on the underside of the case. 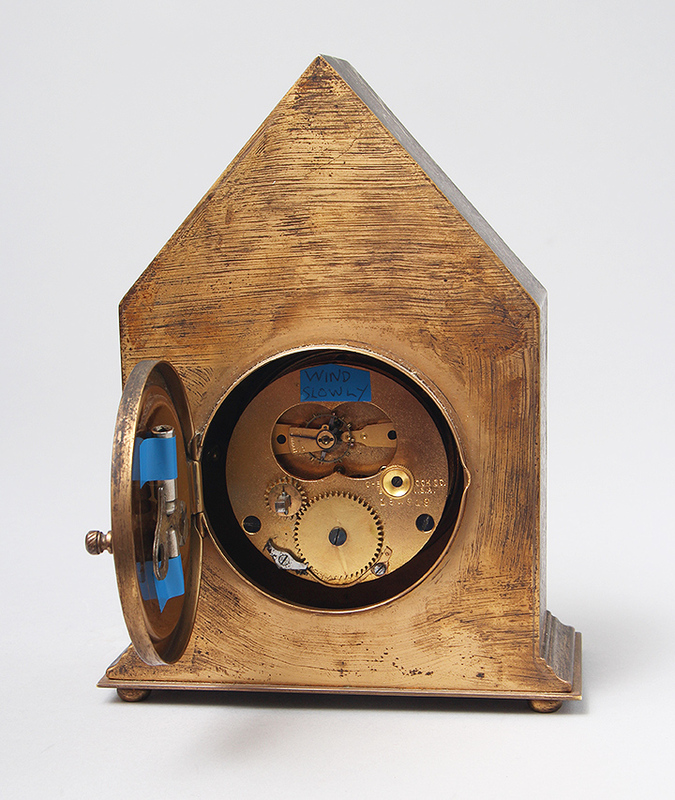 The mechanism is by Chelsea, one of the finest of American makers. 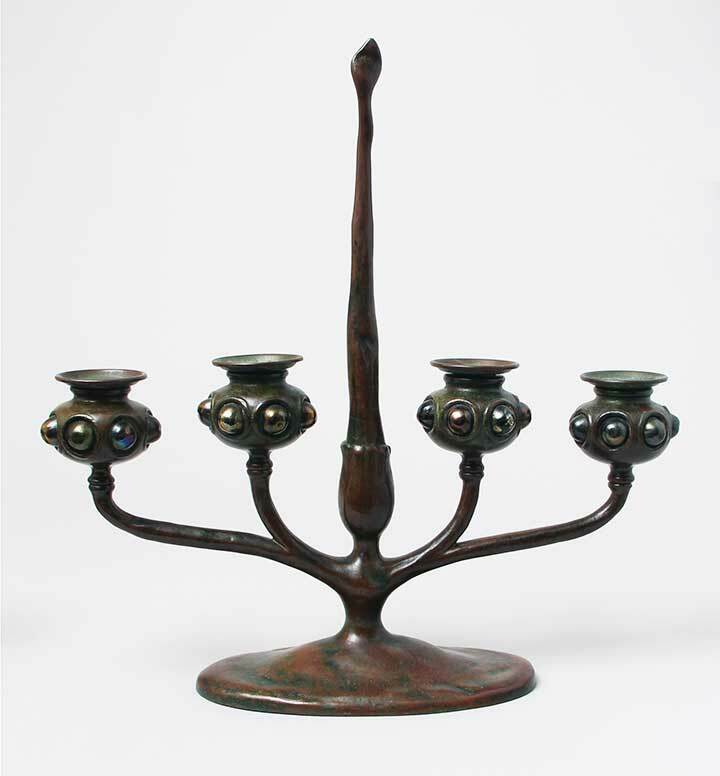 I don't sell many Tiffany Studios candelabra because there's usually one kind of problem or another. So when I had the opportunity to purchase a rare, fine example from a prestigious Washington, DC collection, I didn't hesitate. This example has everything you want. It's big and impressive, with 4 branches. It has jewelled tops. The bobeches are original. 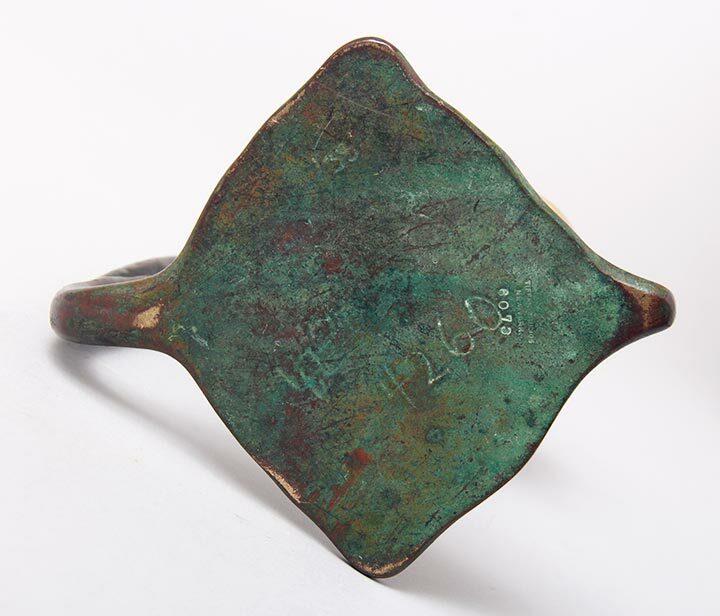 The original patina is superb and finally the snuffer is present. 15" tall x 14½" wide. 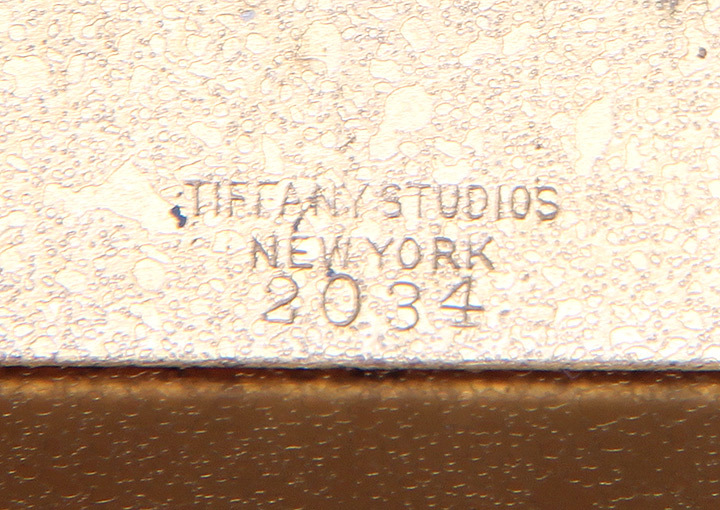 Impressed signature underneath "TIFFANY STUDIOS NEW YORK 1265". Beautiful original condition. 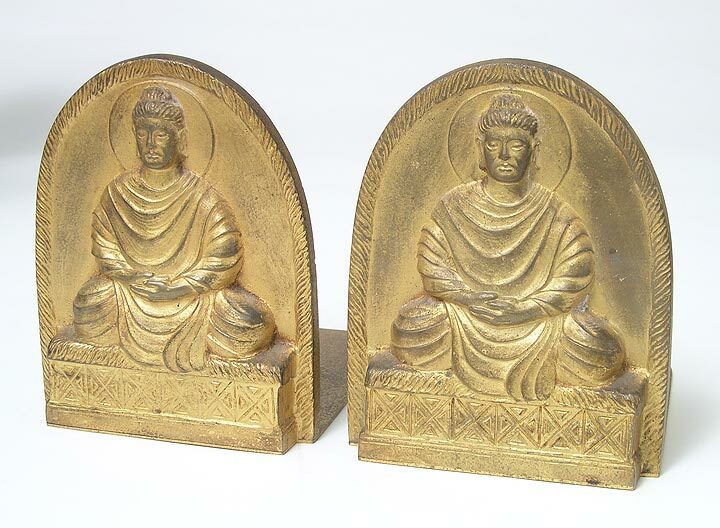 Rare Buddha bookends. Nice condition with normal wear to the gold. 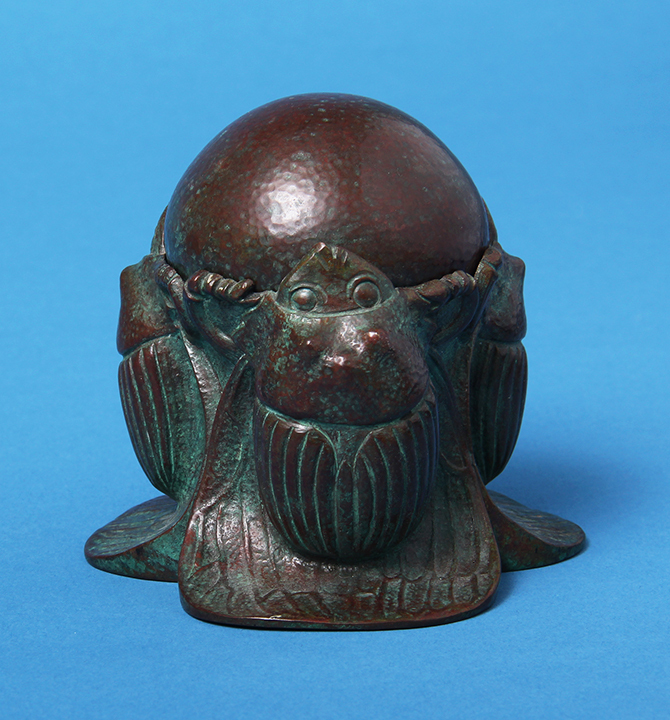 Tiffany made a whole series of bronze animal paperweights. 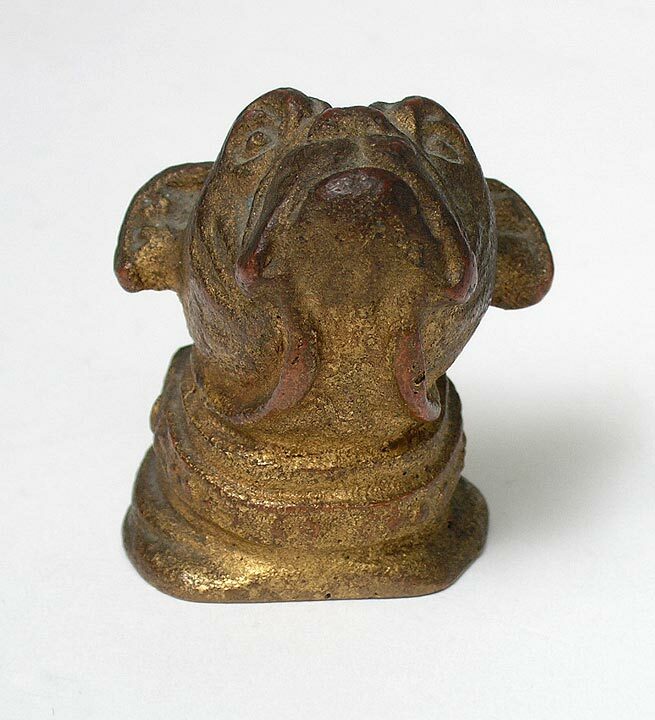 The bulldog is much rarer than some of the others. 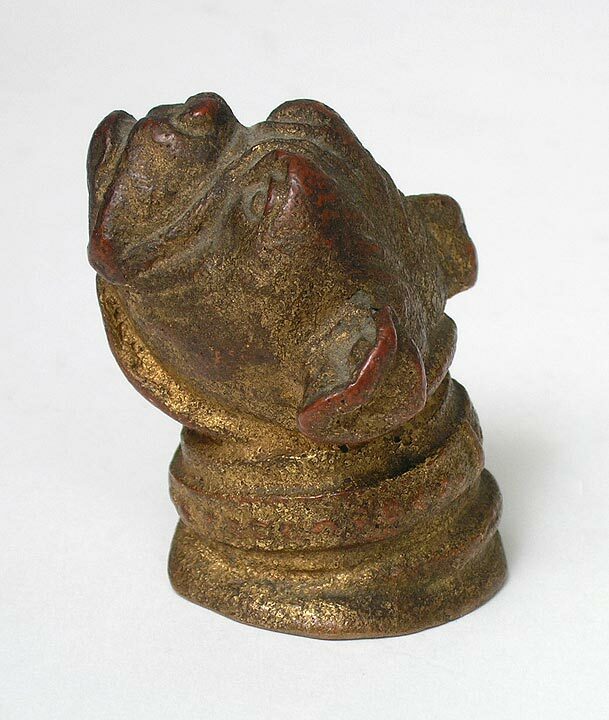 This one has the gold doré finish with normal wear and red highlights to the worn areas (very nice!). 1" tall. Signed. This stick is known as a "Pineapple" stick. It's moderately rare. 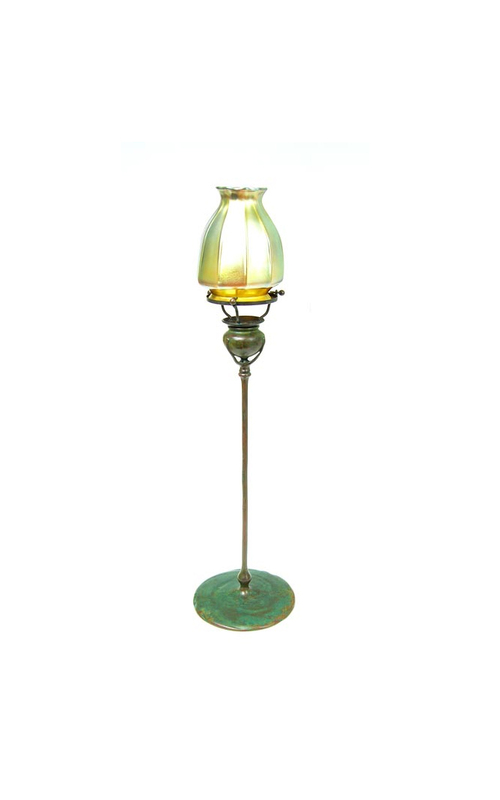 This example has excellent original patina and no damage to the original glass. 15". Signed. 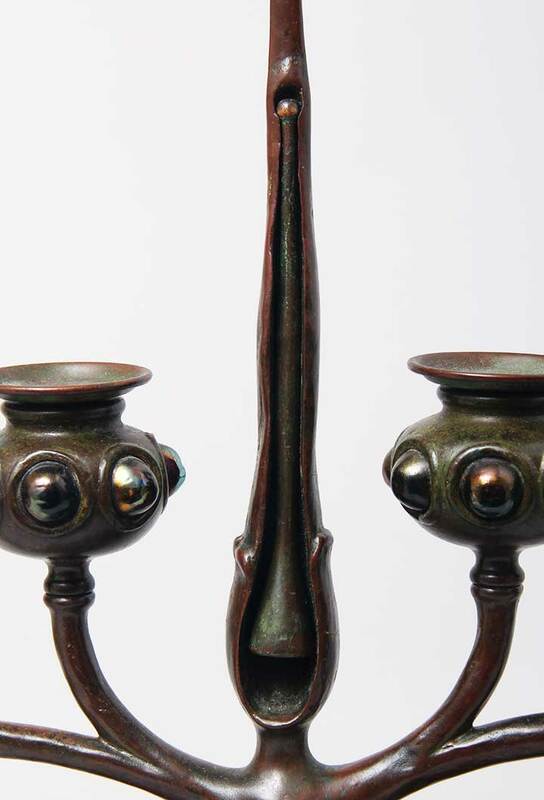 This tall candlestick lamp has all the elements that make it very desirable. First, it's tall -- 17". Second, it has the correct shade in mint condition. 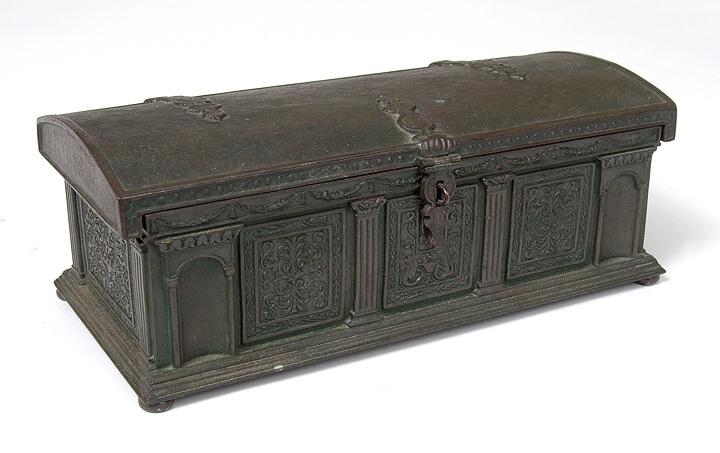 Third, it has a beautiful, rich original patina. Fourth, both the base and shade are signed. 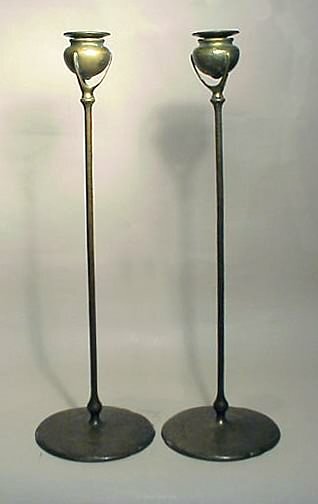 Wonderful original tall pair of Tiffany Studios bronze candlesticks. Statuary bronze doré finish. 18¾". Excellent condition. Signed. Cat's paw model. Original gold doré finish in very good condition aside from slight staining on the bases. 11½". Signed. 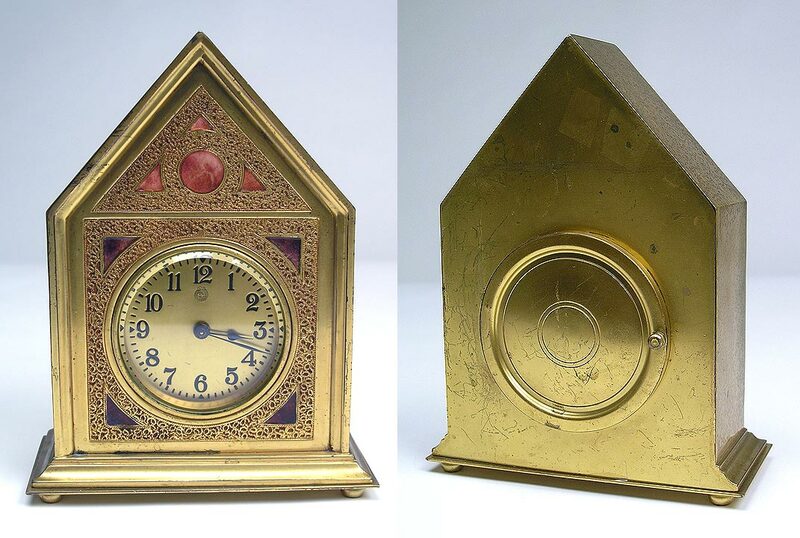 Very rare red enameled clock, working, with original key. 7½" tall. 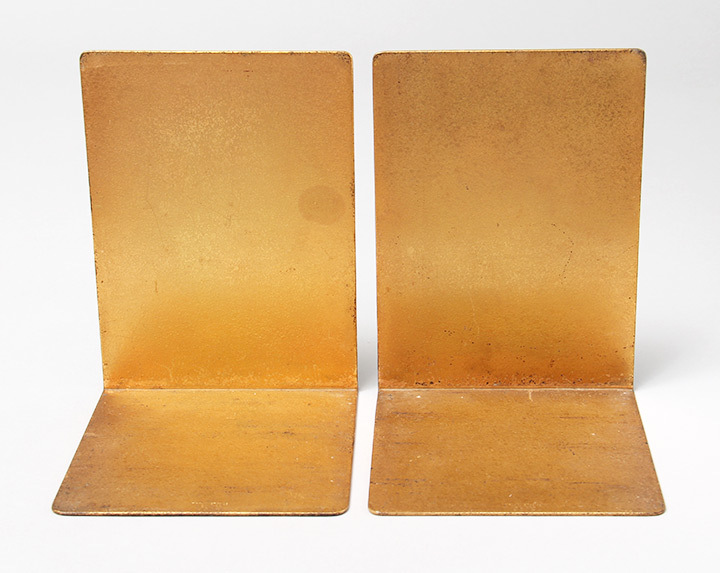 Normal wear to the original gold doré finish. Signed and numbered "651". 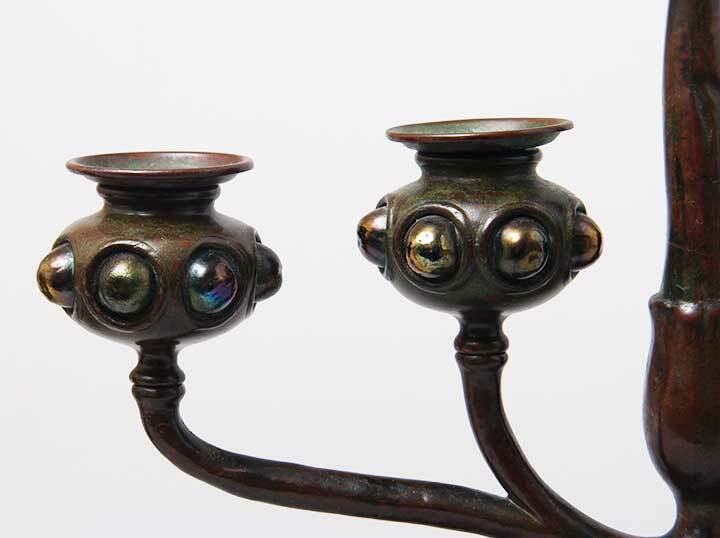 Tiffany Studios Cobra candlesticks are not particularly rare when they're all bronze. 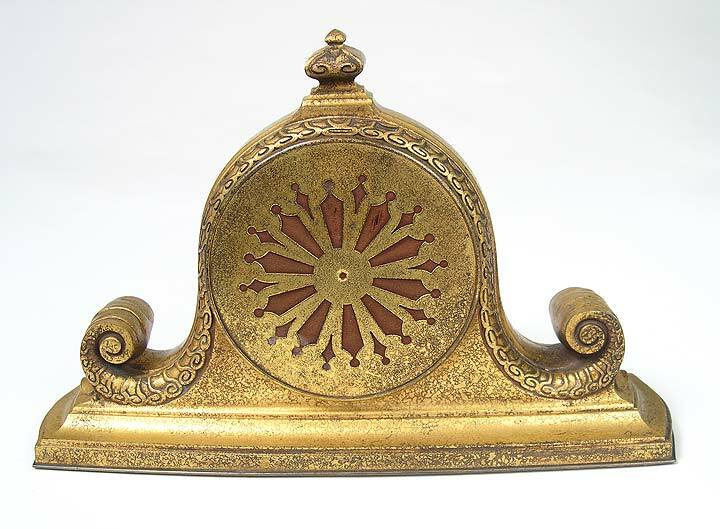 This example has an original gold Favrile bobeche, making it beautiful, rare and desirable. The original patina is rich and fine. 7¾" tall. 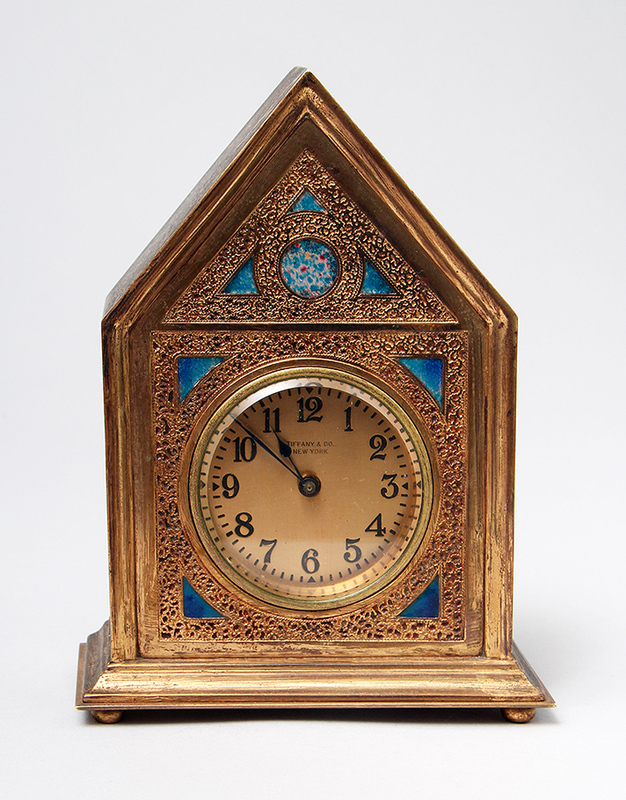 Signed "TIFFANY STUDIOS NEW YORK 6073"
This is one of the rarest clocks that Tiffany Studios made. The enameling is all original and even comes with the original enameled key -- quite a bonus! The clockworks are by one of the best American clockmakers, the Chelsea Clock Company of Boston, Mass. It's being sold as a work of art, so I don't guarantee that the clock works. It may work (and my guess is that it probably does). Signed. Excellent condition. 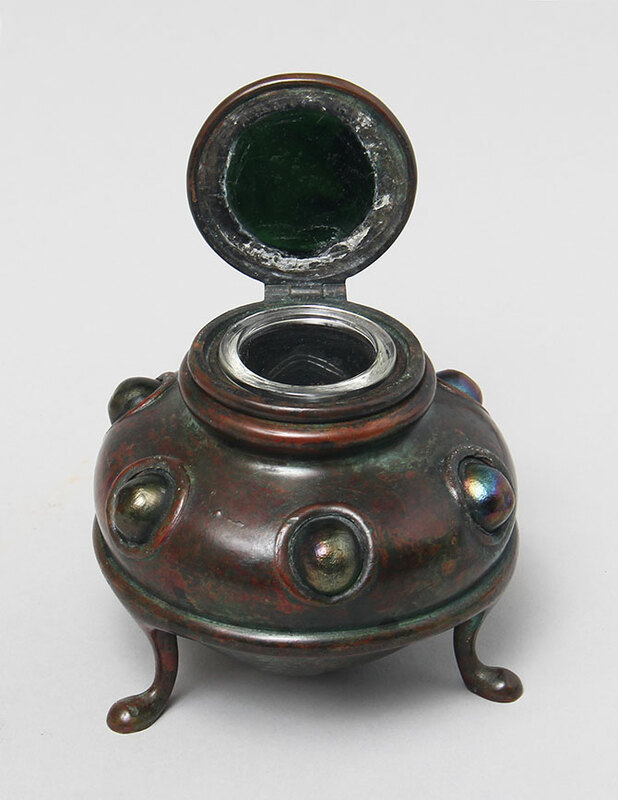 This is a rare inkwell in fantastic condition. The glass is a beautiful green with darker swirls. It's absolutely the original glass and in perfect condition. The insert is also original and in perfect condition. The patina is very nice, especially on the lid. 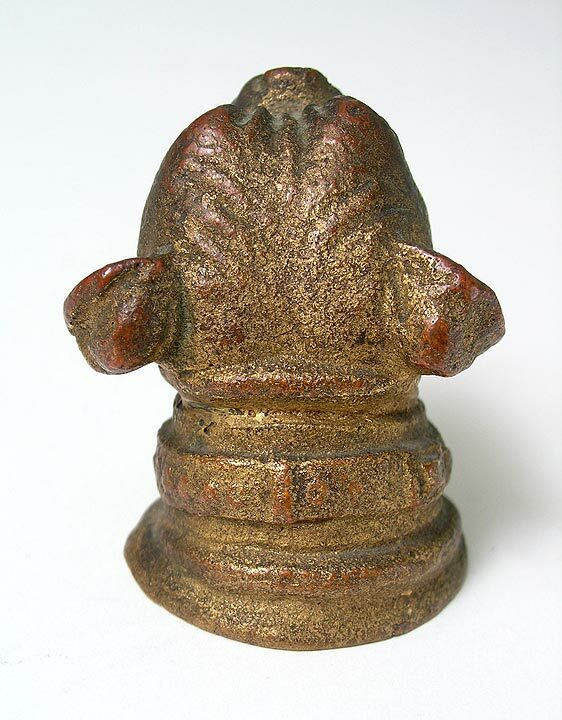 The body of the inkwell has ink stains from use by the original owner. Signed. 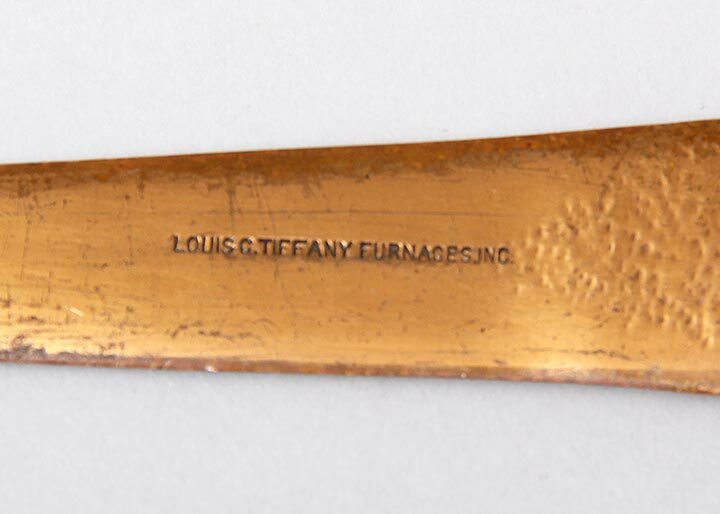 I've owned many Tiffany letter openers, but never this model. (In fact I never knew it existed.) 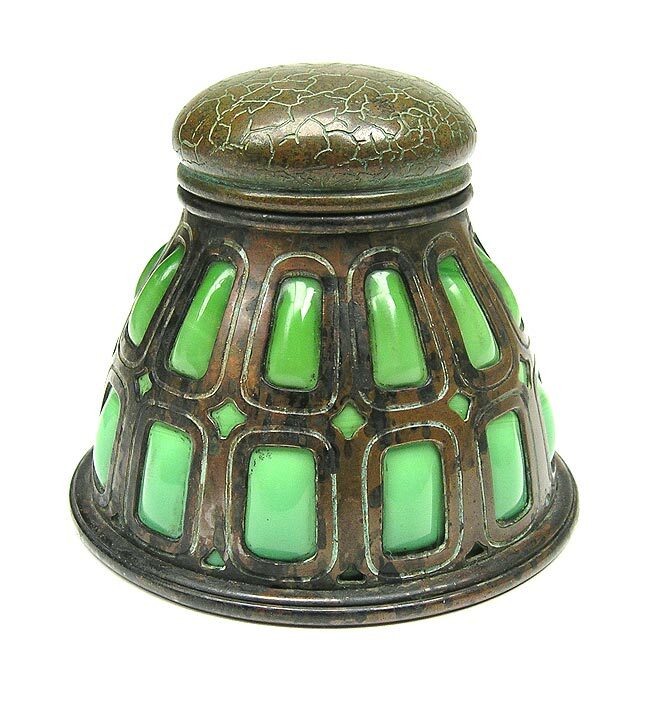 It's very colorfully enameled and signed "Louis C. Tiffany Furnaces Inc.", which dates it to the 1920s. Very rare and very beautiful! Excellent condition. Clocks are moderately rare and desirable. 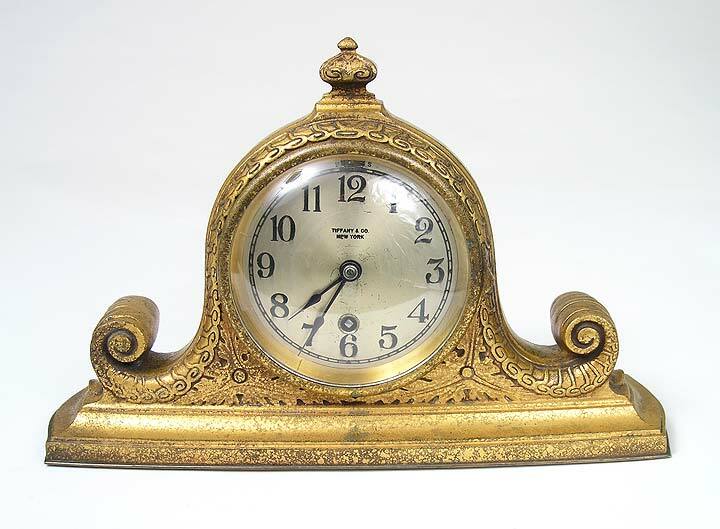 This is a very attractive mantel clock in the gold doré finish. 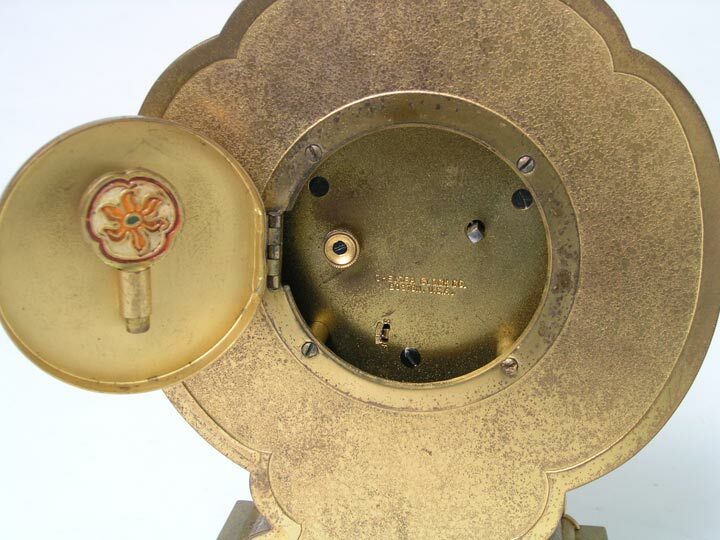 Tiffany used the very fine American clock company, Chelsea, for the mechanism. They are still in business and will tell you the year of manufacture if you call them with the serial number. 7½" tall x 12 " wide. Signed on the face of the clock and the bronze. Excellent condition. 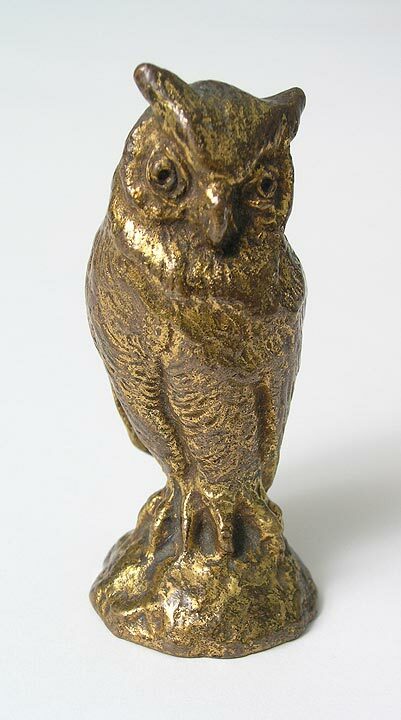 Tiffany made a whole series of bronze animal paperweights. The owl is not as common as some of the others. This one has the gold doré finish in nice condition with normal wear. 3¼" tall. Signed. 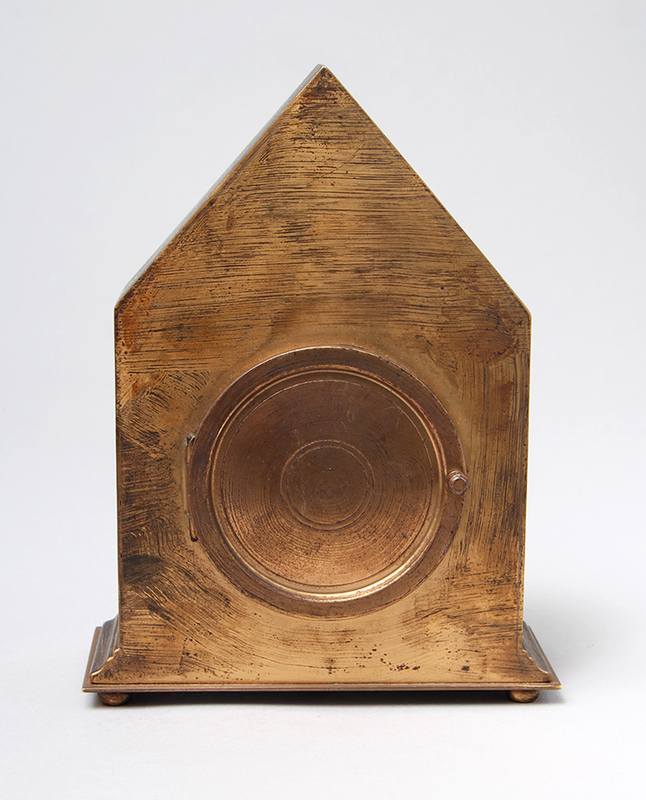 Tiffany Studios bookends in any pattern are moderately rare and desirable, especially since they're useful. 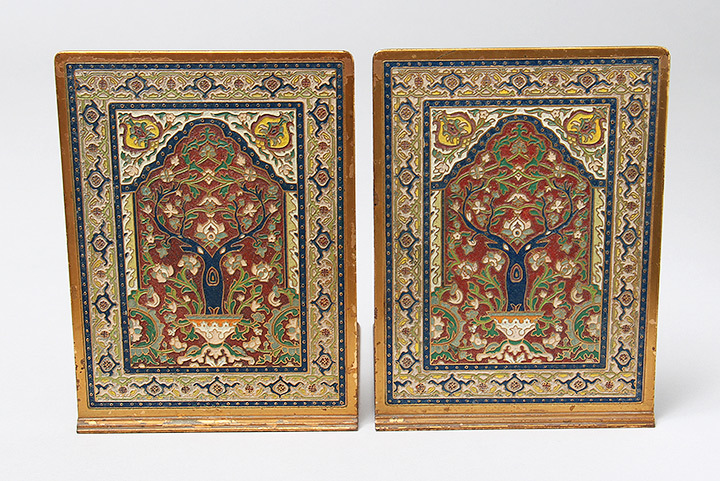 Enameled bookends are much rarer. This is the first time I've had a set in the Persian Rug pattern. The enameling is in fine original condition, with minor wear commensurate with their age of approximately 100 years. The original lacquer on the gold shows some wear. 6½" t. x 4¾" w. Signed. 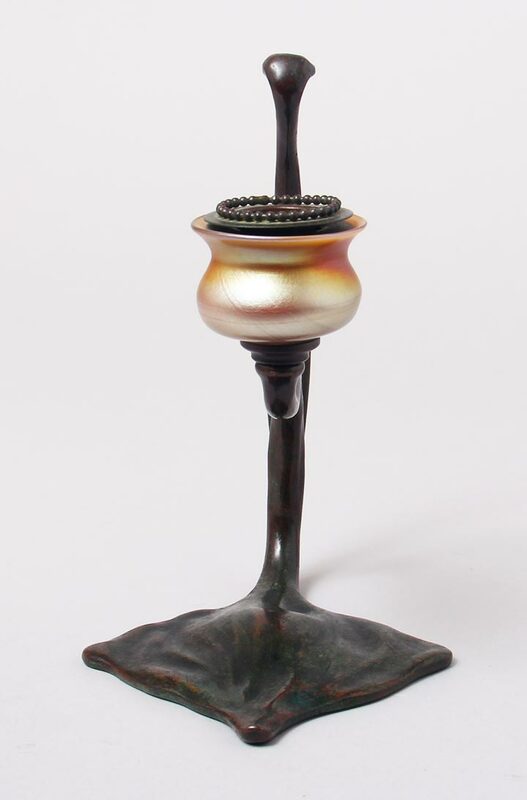 Tiffany made many different models of candlesticks. In some cases, they replaced the standard candle bobeche with a bobeche/fitter combination, so that a shade could be added. This is a much rarer and more desirable combination. 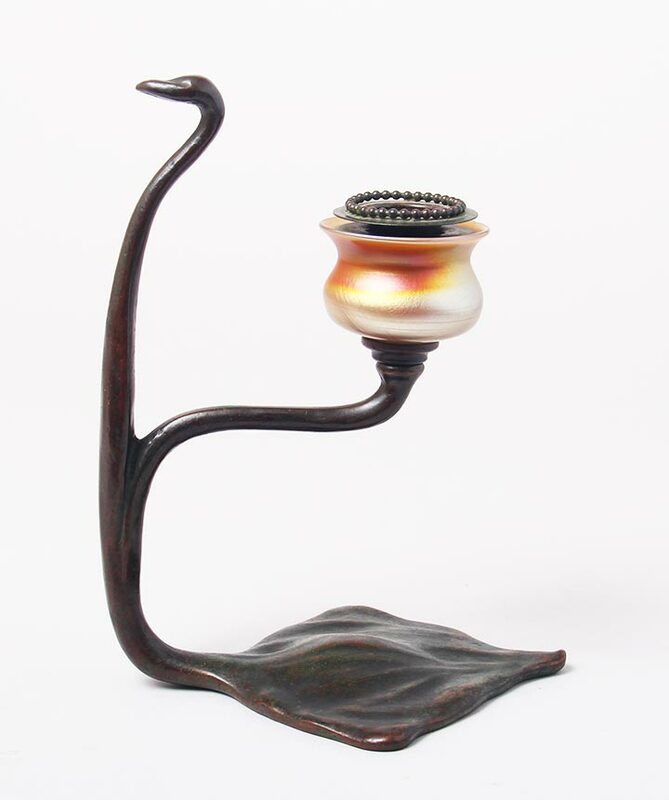 This example includes a rare root candlestick and correct shade. If you find a tulip shade attached to a candlestick, you can be assured that the original shade was lost or broken and replaced with the more available tulip shade. The patina is original and rich. The shade is in mint condition. Both base and shade are signed. 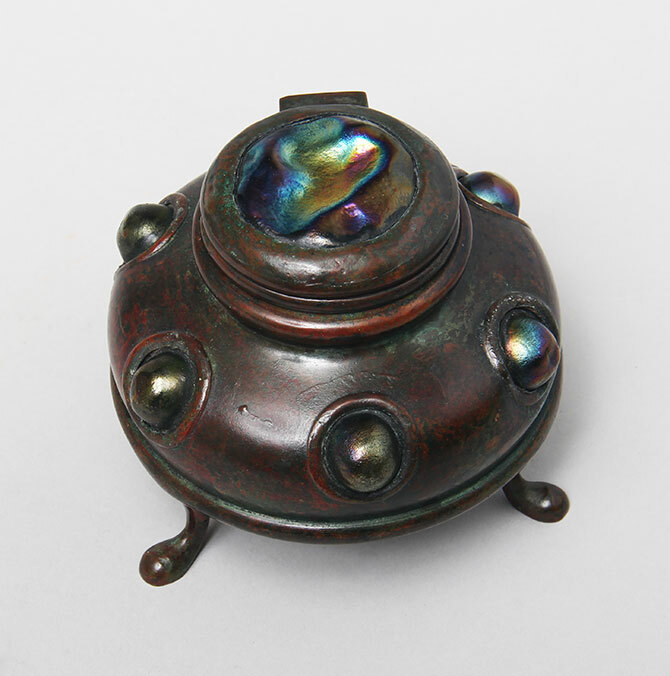 I just bought this very rare Tiffany Studios scarab inkwell from a prominent private collection, along with lots of other fine objects. 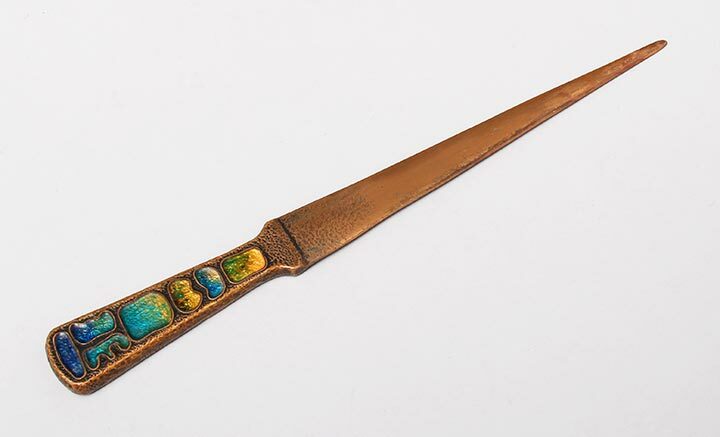 It's one of the very rare and desirable Tiffany Studios' objects. The condition is great with a gorgeous patina. Signed. Mint condition. Rare item. 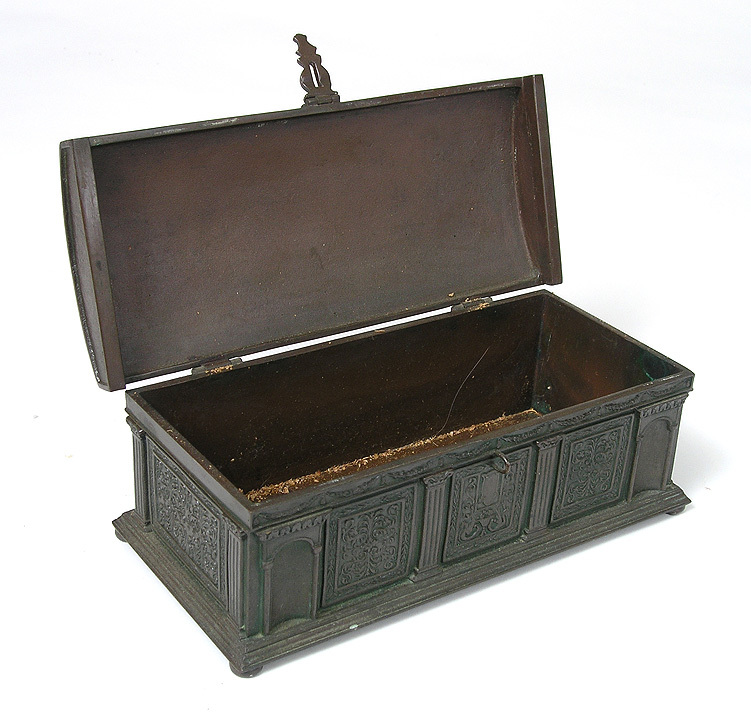 Bronze box in the form of a treasure chest. Nice patina. 8" long x 3¼" wide. Signed. Excellent condition. 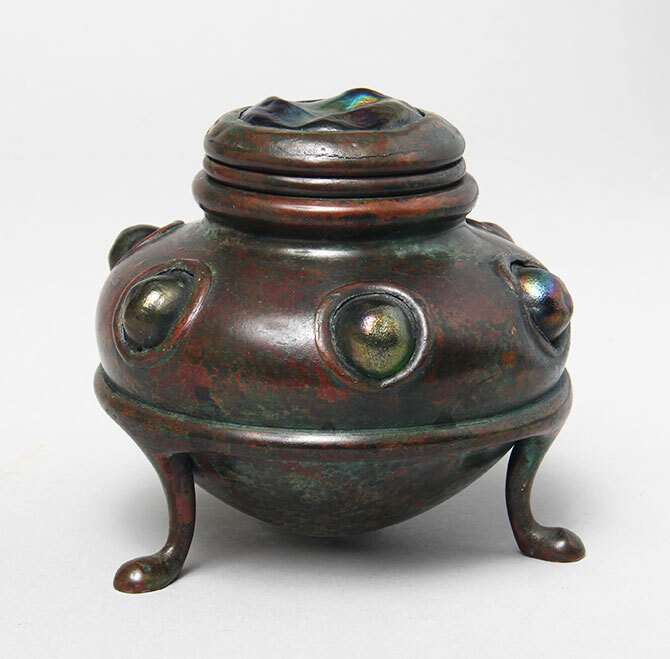 Tiffany Studios inkwells don't get much rarer than this example, with a turtleback lid and inset jewels. Together with a rich, original patina, it's the complete package. 4" tall x 4¼" diameter. Signed. Excellent condition.